Randi Weingarten speaks at a Senate Democratic Policy and Communications Committee hearing on July 10, 2018. 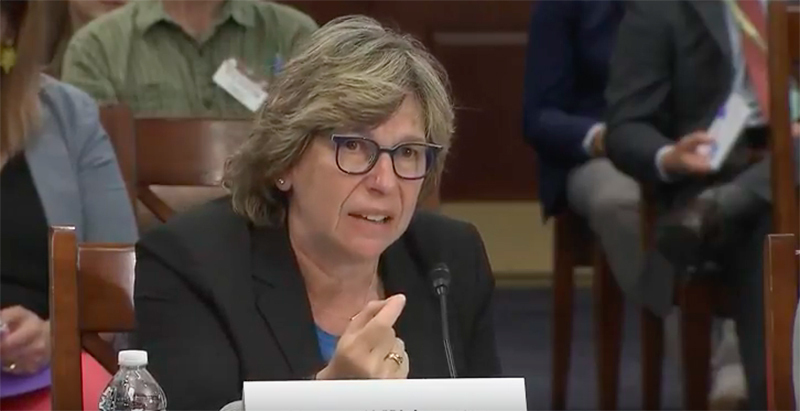 A defiant Randi Weingarten told a panel of sympathetic Senate Democrats this week that public-sector unions are not withering in the face of a recent Supreme Court decision that declared mandatory dues unconstitutional. “What we are seeing is an amazing sense from our members that they are sticking with the union. Something has shifted in the last few weeks and months. I, frankly, in the 20 years, the 25 years of union advocacy that I have done, I have never seen what I am seeing right now,” Weingarten, who heads the 1.7 million–member American Federation of Teachers, said at the Tuesday hearing. The Supreme Court two weeks ago ruled in Janus v. AFSCME that compelling dissenting public-sector employees to pay so-called agency fees violated their First Amendment rights. The 5-4 decision overturned long-standing precedent, which allowed dissenting members not to pay the portion of their dues that covered their union’s political activities but required them to support the costs of collective bargaining and other shared benefits. In addition to losing revenue from dissenters, it’s expected that unions will also see some full-fledged members drop out once freed from the mandatory portion of their dues. The Senate Democratic Policy and Communications Committee, an arm of party leadership as opposed to one of the chamber’s usual standing committees, called this week’s hearing to discuss the Janus decision and what it described as “the secret money campaign to take away [workers’] rights.” About a dozen Democratic senators, including Senate education committee ranking Democrat Patty Murray and policy committee chair Debbie Stabenow, were on hand. Democrats and unions have long maintained that the First Amendment arguments in Janus were a red herring designed to disguise wealthy right-wing donors’ real goal of limiting union power and, consequently, their money and support for Democratic candidates. “Many Americans have interpreted the Janus decision as a pure and simple case of union busting,” said Nancy MacLean, a professor at Duke University. In reality, she said, it was “a crucial piece of the radical right’s stealth plan” to remake the country in its libertarian worldview and take power out of the hands of ordinary citizens and give it to big business. Those from the other side of the political spectrum assert that unions and their steady stream of revenue from dues have outsize influence on lawmakers in protecting costly taxpayer-funded pensions and resisting workplace reforms. Plaintiffs in the dues cases argued that for public-sector unions, standard collective bargaining is political because it involves public money for salaries, retirement, and other benefits and employment policies that affect the public, such as seniority-based layoffs. The Janus decision is now being cast as part of a much larger struggle between conservatives and liberals over President Donald Trump’s nomination this week of Brett Kavanaugh, a conservative federal judge in Washington, D.C., to the Supreme Court. Kavanaugh, if confirmed by the Senate, would fill the seat vacated by Justice Anthony Kennedy, a swing vote on such divisive issues as affirmative action, abortion, and marriage equality. Senators said Kavanaugh is likely to continue the string of court cases, including Janus, driven by right-wing donors to promote corporate interests. “We’ve all been reviewing the record of Mr. Kavanaugh, and he looks to me like if confirmed, he would be a poster guy for powerful corporate interests and dark money,” said Sen. Ron Wyden, Democrat of Oregon. Christine Marsh, Arizona’s 2016 Teacher of the Year and a state Senate candidate this fall, also spoke, saying teachers across the country are fighting back, buoyed by walkouts and other protests this spring. “We are fighting groups with endless amounts of money … they will not be giving up their attacks, but we also know that no amount of money can silence America’s teachers,” Marsh said. Most of the strikes this spring demanding increased teacher pay and greater education funding were in right-to-work states where educators weren’t required to pay union dues and the Janus decision will have no effect. The AFT, for its part, Weingarten said, has focused its response, as early as January of this year, on engagement with members, including a re-commitment campaign. More than half a million of the union’s 800,000 members who live in states that previously had mandatory dues laws have re-committed, she said. “People are not dropping, they’re joining. You hear the defiance in my voice, it’s because people are sticking with their union because they understand that what we can do together is impossible for people to do alone,” she added. Weingarten’s comments contrast with the experience of the 3 million–member National Education Association, the nation’s largest teachers union, which was anticipating 300,000 lost members and a $50 million budget cut as a result of an adverse Janus decision. Shortly after the Janus ruling, right-wing groups started contacting members encouraging them to leave the union, witnesses said. Some AFT members are returning those letters and emails “saying don’t bother us, I’m going to sue you for invading my privacy,” Weingarten said. 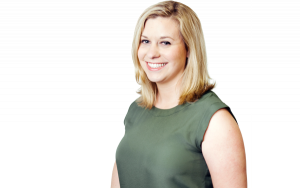 The union is also looking at “a bunch of different legal options,” which she did not detail, and working to expose the right-wing groups behind those efforts, she said. Meanwhile, numerous Democratic-controlled states have already taken steps to blunt Janus impact by passing laws giving unions greater access to employees and their contact information to make their case, providing for automatic dues deductions, and limiting opt-out windows for dissenting employees. Some of those provisions may be moot since the Supreme Court also ruled in Janus that union members must now affirmatively opt into membership — rather than requiring dissenters to opt out.